I wrote this many years ago in a book. How do you see this now? In the Mosque on Stony Island Avenue, Chicago, Illinois, July 30, 1972, the Honorable Elijah Muhammad said, at one point, before around 3,000 people: “I want you to remember today I have one of my greatest teachers here...” (At this point he turned his head towards Minister Farrakhan, who was sitting, in the last row, in the section where the ministers were seated to his right.) “...what are you hiding behind the sycamore tree for, Brother. Come on out here so they can hear you. We have with us today our great national preacher, the preacher who don’t mind going into Harlem, New York, one of the most worst towns in our nation or cities. “It is our brother, in Detroit or Chicago or New York. But I want you to remember, every week he is on the air, helping me to reach my people that I can’t get out of my house to reach like he. I want you to pay good attention to his preaching. His preaching is a bearing of witness to me and what God has revealed to me. The Honorable Elijah Muhammad often said and did certain things with the future in his mind. As a result of times his words and acts were, there­fore, misunderstood. This type of misunderstanding is not the fault of such men of God. Why did I put his words in a book and now here in this article? It is, most often the fault of the listeners. On a higher level (in many cases, though not all) it is not really the fault of the listen­ers either, as these kinds of words are meant to be understood in the fu­ture. The above words could not be understood in 1972 as they can now be understood. This fact holds true, generally, for the whole body of infor­mation he left in 1975. The Honorable Minister Louis Farrakhan has been—in the words of his teacher—helping him to reach Black people, and others, since he can’t get out of his house to reach them like he. Before he departed, at certain times the Honorable Elijah Muhammad was not able to come out and teach in the public—as his helpers, especially Minister Farrakhan—were. However, he directed his helpers, by the power of Allah. 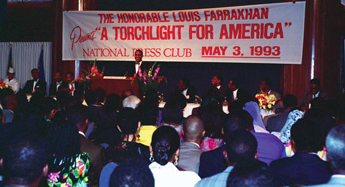 Likewise, even though he is not now seen, in the ordi­nary physical sense, in and by the public; he (the Honorable Elijah Muhammad) is yet directing the Honorable Minister Louis Farrakhan and others, even as you read these lines, from the place where he is. God has blessed the Minister’s reach to extend right into the hearts of Black people and others. He has become the premier Black leader, with­out having to bow to the wishes of those who oppress his people. Minister Farrakhan’s work and success demonstrates the truth of the Bible and the Holy Qur’an—both of which are instruments of God. In these days of the resurrection of the dead and the judgment of this world, God gave the same divine instruments, to both the Honorable Elijah Muhammad and the Honorable Minister Louis Farrakhan. This was foreshadowed, for example, in the history of Moses and Aaron. They were both given the same instrument to save their people from their oppres­sors. The former guides the latter in the use of the same divine instrument, which, in the nature of things, is as it should be. These vitally important words of the Honorable Elijah Muhammad—which opened this chapter—have proven to have profound implications for Black people and the world. If Minister Louis Farrakhan (who is re­ferred to in the Bible and Holy Qur’an under several names and titles, in­cluding Minister) is the fulfillment of the sign left by Paul; then of whom are the rebellious Jews a sign, there in the book of Acts? Of whom are the Gentiles a sign? How can it be shown that both Peter and Paul are signs of Minister Farrakhan? Why should it be done? Don’t say that two men who may have been contemporaries of one an­other, in the past, cannot be signs of one man in the future. Abraham and Lot were contemporaries. They were alive on earth at the same time. Al­lah made both of them prophets. Allah made both of them signs of one man: the Honorable Elijah Muhammad. (The sign of Lot goes a little be­yond that.) Again, why should this have been? There are those who say that they think that Minister Farrakhan will fall again. They express doubts as to the depth of his commitment to the Honorable Elijah Muhammad; to the truth that he taught; and to the work that he did. They make such vain claims even after all of the work, sacrifice and profound displays of faith on the part of Minister Far­rakhan. Some of these people even acknowledge, in a backhanded fashion, that Peter/Paul are signs of Minister Farrakhan. But they con­tinue to raise this so-called legitimate question of whether or not he will deny his Lord again, and whether or not he will be forgiven. So-called means here: improperly so named; being something in the name or form only. If such superficial people understood the Honorable Elijah Muham­mad, the Holy Qur’an and Bible as they think they do, or as they could; if they were sufficiently in tune with the Divine Supreme Being and His will, they would have no problem in seeing their Brother (Minister Far­rakhan) near to the way God, the Christ and the angels of heaven see him. There­fore, they would not think to raise the so-called legitimate question men­tioned in the previous paragraph. Instead they would be praying for his success. There is nothing in the words of the Honorable Elijah Muhammad or the scriptures that justifies either the partial or the outright rejection of the Honorable Minister Louis Farrakhan. Nor is there anything of or about the Minis­ter, which justifies such rejection. To deny him is to deny the mercy and grace of God and His Christ; for we are certainly in the time of grace from Allah and we certainly need His mercy. Mercy has been divinely offered through Minister Far­rakhan. Again, to deny him is to make mockery of the concept of re­pen­tance. Why do you think it is put there in the scriptures (Matthew 18:21, 22) that it was Peter who asked Jesus “Lord, how often shall my brother sin against me, and I forgive him? Till seven times?” Look at the answer that Jesus gave in verse 22. If you know anything about the Honorable Elijah Muhammad and the divine love with which he loved, and loves us, (a very ungrateful people) then you can better understand the nature of that answer in verse 22 and the loving and merciful spirit that Allah put in the heart of Minister Farrakhan, as He was preparing him for the Honorable Elijah Muhammad in particular, and us in general. The Honorable Elijah Muhammad did not just accidentally or casually choose our Brother, Minister Farrakhan, to sit in his seat in his absence. At a certain point he knew exactly how this great Brother fits into the di­vine scheme of things, which is wisely laid out in the Bible and the Holy Qur’an.